Success! These baked mozzarella sticks were delicious! I am happy to report that I enjoyed these as much as normal, fried mozzarella sticks. These have a nice, crispy coating, and they are gooey and melty on the inside. I love these cheese sticks! Have I mentioned how easy these were to make? They are definitely worth making. I can’t believe the calorie content in these compared to fried mozzarella sticks. I don’t think I will ever need to eat fried ones again. I will continue to work on this recipe to try to get Samuel some more crunchy coating on the outside, but until then, I am completely satisfied with these! I may make them again today…and tomorrow. Before you actually start on the real recipe, you will need to freeze your mozzarella sticks. This will help them from melting too much during the baking. Cut your string cheese in half, so you end up with 12 half sticks. Wrap them in plastic or put them in a zip lock baggie, and stick them in the freezer for at least 30 minutes. 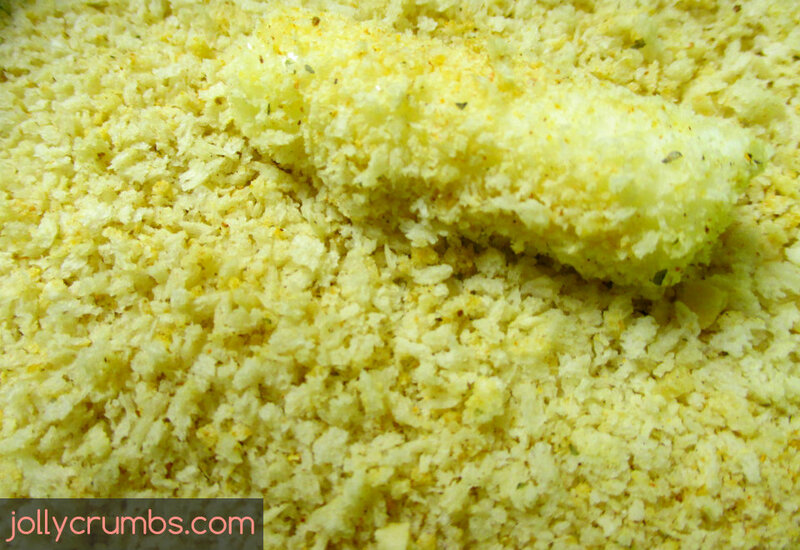 When you are ready to start making the mozzarella sticks, start by toasting your panko bread crumbs and seasonings. Bring a small skillet to medium-high heat. Once it’s hot, add the panko and seasonings. Toast for about 2 to 5 minutes so the crumbs get crunchy. Make sure to stir the panko continuously so it doesn’t burn. When the seasoned panko is toasted, pour it into a small bowl. Place the milk in a separate small bowl. Dip each of the frozen half mozzarella sticks into the milk and then place them into the panko. Press the panko firmly onto the mozzarella. Try to get as much of it to stick as you can. Then place the sticks onto the prepared baking sheet. 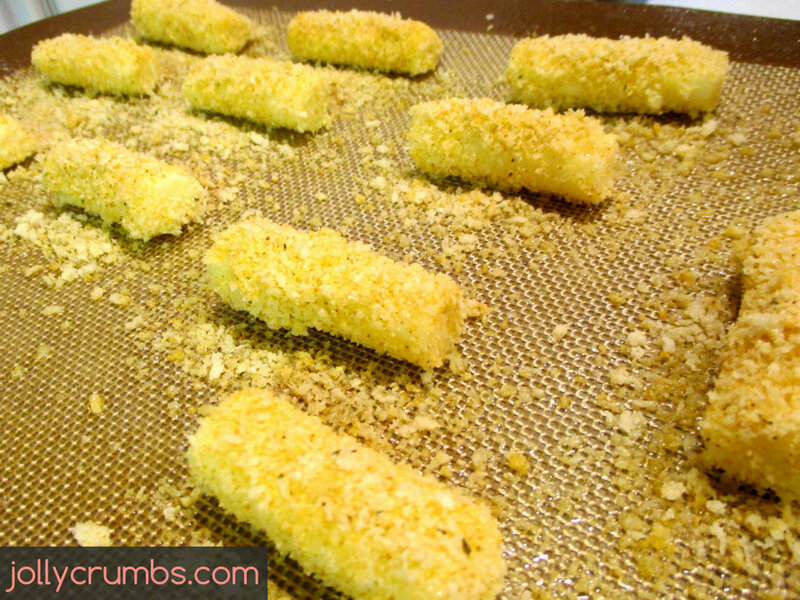 When you have all the sticks dipped, spray them with nonstick cooking spray and sprinkle additional panko over top. Bake for 5 to 6 minutes, or until the mozzarella sticks are heated through. Some of the sticks may melt some, but they will firm up as they cool, so you can press them back into place. I didn’t mind the melty ones since they were going to be dipped into marinara and devoured instantly! This is a very simple, no fuss recipe for baked mozzarella sticks. And it was successful! Sure, a couple of my sticks melted, but they didn’t melt so terribly that they still weren’t delicious. We dipped them in red sauce, but ranch would also be delicious with these. They have a delicious crispy coating and a melty, cheesy inside. I absolutely love this lower calorie mozzarella stick option. Samuel asked how we could get more coating on them. I love the way these turned out, but I can see where more coating wouldn’t be a bad thing. I am going to continue to work on this recipe and see how these could be made better, so watch for updates in the ingredients list and directions! Freeze the mozzarella sticks until they are completely firm, at least 30 minutes. Preheat oven to 350°F. Line a baking sheet with parchment paper, aluminum foil, or silicone baking sheet and spray with nonstick cooking spray. 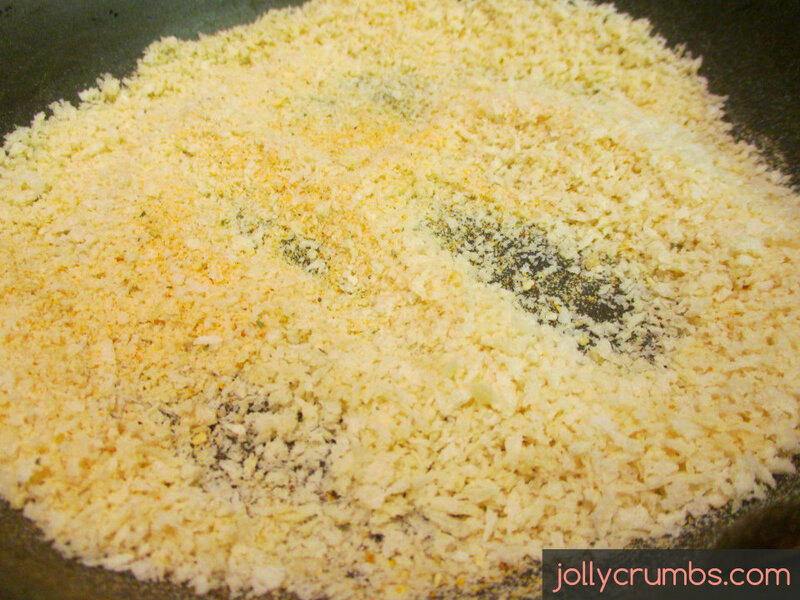 Toast panko and seasonings for about 2 to 5 minutes in a skillet set to medium-high heat. Stir panko continuously so it does not burn. Place toasted panko into a bowl. Place milk into a separate bowl. Dip each frozen half of mozzarella into the milk and them place it into the panko. Press the panko onto the mozzarella. Place crusted cheese sticks onto the prepared pan. When you have them all dipped, spray them again with nonstick spray and sprinkle additional panko over top of the mozzarella sticks. Bake for 5 to 6 minutes, or until heated through. (Cheese may melt slightly and lose shape. Simply press it back into place.) These will firm up into a stick you can grab! These look delicious, again my husband would love these! 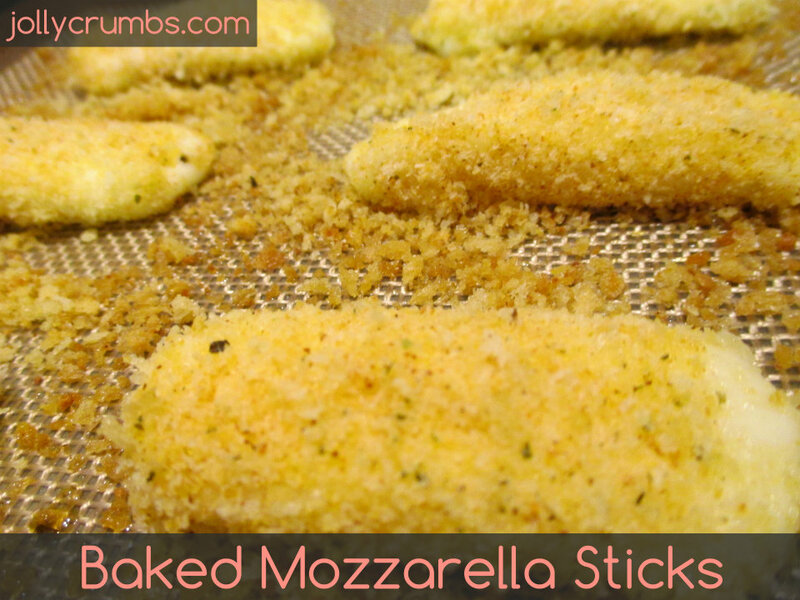 I Tried these baked mozzerella sticks and they turned out perfect! I double dipped them in the milk and then the crumbs and they turned out nice and crunchy. Perfect! I also usually double dunk mine to keep them extra crispy!